If you’re thinking Liam Neeson, think a little smaller. 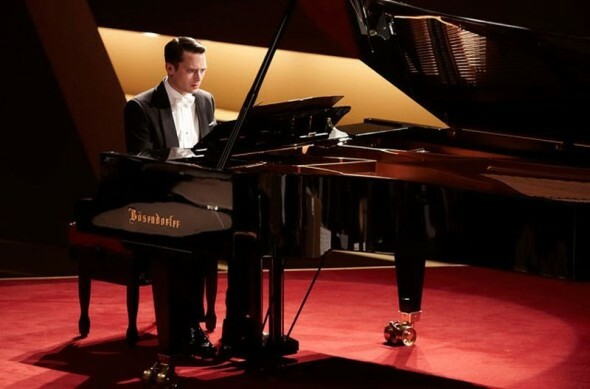 Elijah Wood is the star of Grand Piano, as stage-fright prone master pianist Tom Selznick. Returning to the stage after a five-year hiatus, Tom finds an unexpected piece of music inserted into his planned repertoire. It is an “unplayable” piece, and one that he botched big-time in a previous try. A hand-written message on the sheet music, coupled with a sudden laser target on his chest, give Tom extra motivation: play it perfectly, without missing one single note, or die. Ladies and gentlemen, it’s request hour! Much like Neeson’s recent thriller Non-Stop, Grand Piano does a fine job setting up an engaging premise, only to stumble trying to find a worthy way out. Screenwriter Damien Chazelle invents clever twists to keep the tension going, providing multiple Hitchcock homages that are able to toe an entertaining line between cheesy fun and pretentious contrivance. Chazelle has the perfect partner in director Eugenio Mira, who seems almost gleeful in the way he sets the pace. Multiple perspectives are blended with skill, precision and timing, not the least of which are impressive concert sequences of Wood appearing to be a virtuoso. The unplayable piece and the deadly situation escalate in delightful symmetry, and Wood deftly conveys the persona of a man pushed to the edge of both his nerve, and his talent. In case you don’t already know who plays the baddie, I won’t spoil it, but his battle of wits with Wood is all fiendish fun until everyone involved must deal with that pesky conclusion. After the buildup, it smacks of a give-up, or something lifted from an old episode of Magnum, P.I. Sure, there are a couple leaps in logic and classical music fans will likely nitpick the concert details, but until that last sour note, Grand Piano stays in tune. ← Who Wants a Cocktail?